Missing a long-anticipated deadline for launching a new app or new feature is incredibly frustrating. Often, there are so many moving parts that it’s hard to imagine moving faster. Business owners and technology leaders can resolve some of these issues without hiring additional headcount. These tips can help you avoid future pitfalls and get your products delivered to market faster. Many small teams and startups take a NoOps approach to building applications. Don’t want to store passwords and worry about the security around that? Use social auth. Don’t want to maintain servers? Use a hosting company. This can give teams flexibility and focus. Developers at small companies are often unsung heroes that seem to know a lot about everything. Many are completely capable of connecting APIs and microservices. Many know a lot about server security and optimization. However, your developers’ primary focus should be on building core application features. Overloading them with work unrelated to coding can cause missed launch dates. No matter how competent your developers are, it can take a lot longer to ship features when they’re tasked with more than delivering a clean, bug-free application. Do they also help maintain your data infrastructure? Do they take care of software management? Are they tasked with backup and recovery of database information? Are they also on their own when troubleshooting data issues? To help focus your developers, make sure that they always have easy access to data. This is where outsourcing your database to a trusted partner can help. Database as a Service (DBaaS) providers like ObjectRocket can take on the responsibility of maintaining the backend and making sure your developers have the data needed to test out the application thoroughly. Using a service means you don’t need to hire additional headcount. Putting a DBaaS solution in place ensures your application’s data is highly available and secure. Your developers can focus on optimizing their code instead of troubleshooting MongoDB. By leaving the database details to the database experts, you’ll avoid inexperienced, well-meaning developers making critical mistakes they’re not able to resolve. ObjectRocket engineers and DBAs work with developers to help them understand how best to work with NoSQL databases in the most efficient way possible. You’ll have someone in place who can walk everyone through best practices and allow them the time needed to become familiar with the technology. Our engineers have familiarity with a wide range of development languages and processes. They’ll use that knowledge to work with developers no matter their background. Everyone is talking about moving their data and applications to the cloud. One big problem is that many small development teams don’t know how to set up the infrastructure properly for their data. Many are left to sink or swim. Failing to properly scale for the needs of the business may end up forcing you to put off your big release. Someone new and unfamiliar won’t be thinking about all the underlying intricacies involved in building the solution correctly. Here are just a few of the things to consider when configuring a cloud solution. It takes time to configure physical hardware and software for application testing and development. A better approach is to use a cloud service so that your developers can have dedicated test and development systems. With DBaaS in the cloud, the strain on your DBA and programmers is greatly reduced. Configuration and deployment of virtual systems is much quicker. ObjectRocket understands what’s involved with setting up open source data store in the cloud. We can assist your data architects and developers in using best practices. Having database cloud experts on-call 24/7 can speed up the development process. No more delays caused by poorly constructed solutions. Let ObjectRocket relieve the headaches involved in maintaining and optimizing data for your app and related cloud technology. Your developers gain access to valuable support while having the time needed to build your application to meet the expected quality standards. Our services help you reduce the time it takes to get your apps and features to market. Reach out to us today and set up a free trial for your company. 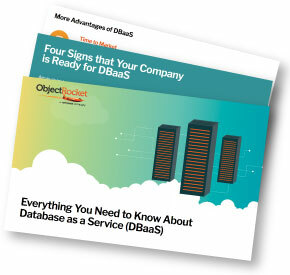 Learn why DBaaS is booming and get a checklist of questions to ask vendors to find the right fit for your business. Subscribe to our emails and we’ll let you know what’s going on at ObjectRocket. We hate spam and make it easy to unsubscribe. MongoDB® is a registered trademark of MongoDB, Inc. Redis® and the Redis® logo are trademarks of Salvatore Sanfilippo in the US and other countries. Elasticsearch® is a trademark of Elasticsearch BV, registered in the US and in other countries.